Wounded Wm. Carpenter, Officer. 13: Grabshot of suspect James DeMent at Downey Police Sta. 9" Suspect James DeMent, left, being questioned by Downey Police Captain J.C. Martin. 16: Downey P.D. 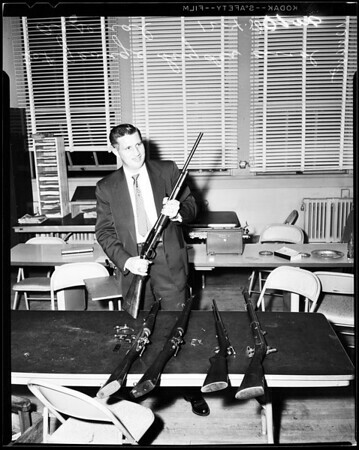 Detective George Snyder examines shotgun used in cop shooting and displays on table arsenal found in apt. of suspect. (This was passed up by night news editor at 12:30 a.m.)".